-George Feiger, chief executive officer of Contango Capital Advisors, wealth management arm of Zions Bancorporation. Feiger manages $3.3 billion at Contango and Western National Trust Co. This is detailed in a new book by Simon Lack titled The Hedge Fund Mirage: The Illusion of Big Money and Why It’s Too Good to Be True. Mr Lack reckons that hedge funds have lost enough money in 2008 to cancel out the entirety of profits made in the prior ten years. If you are looking for something to blame, consider the unholy trinity of capital outflows, a flat 2011 market and high volatility. 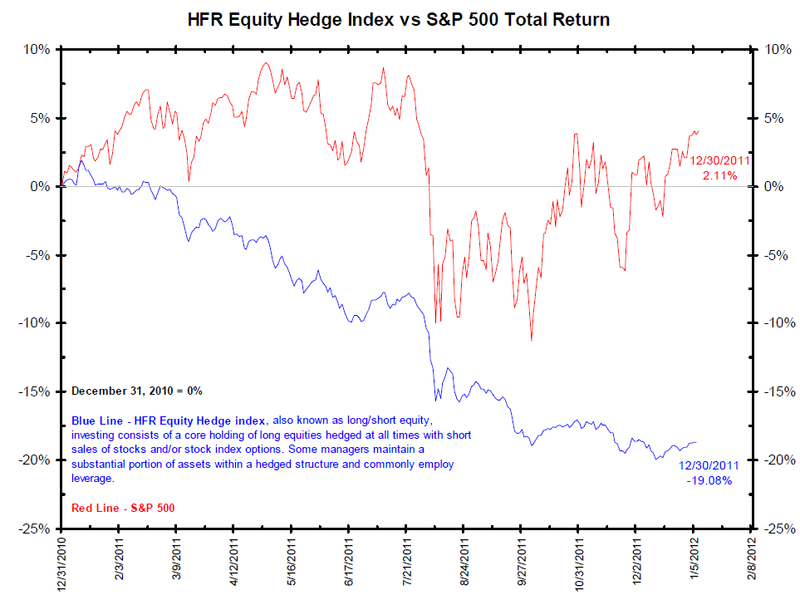 That was a challenging environment for hedge funds and mutual funds alike. 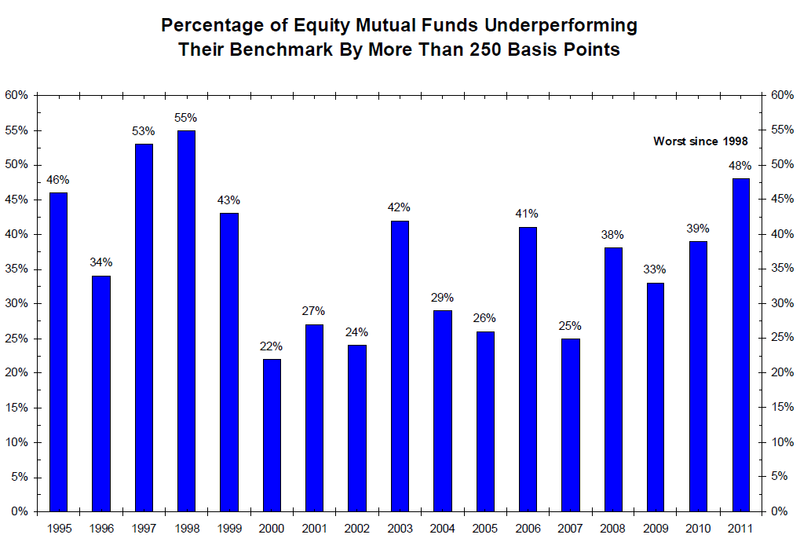 I suspect people are disappointed when a mutual fund under-performs with fees of 0.75 to 1.75%. But the fee structure of Hedge fund managers — 2% + 20% of the profits — is why some of them face real trouble. Its bad enough to under perform, but institutions hate paying up for the privilege. 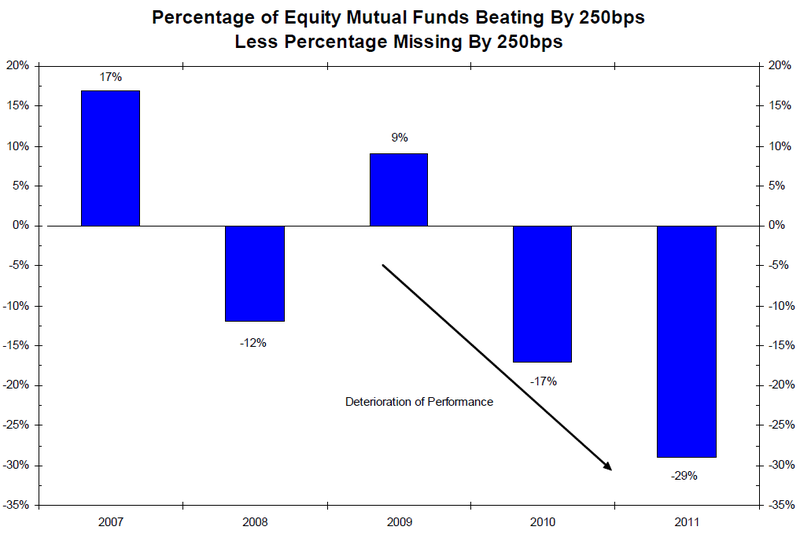 Perhaps 2012 is the year fund managers mean revert and redeem themselves. If they don’t they should not be surprised at massive redemptions each time their window opens. This post originally appeared at The Big Picture and is posted with permission. 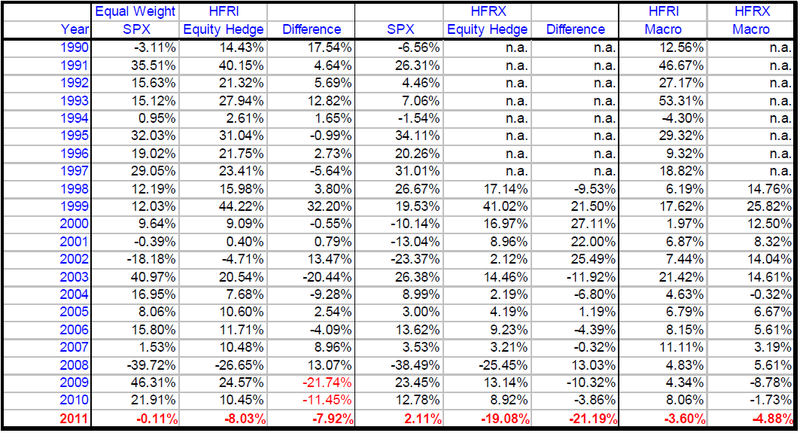 2 Responses to "2011: Disastrous Year For Mutual, Hedge Fund Managers"
Because hedge funds are not sold to the public or retail investors, the funds and their managers have historically not been subject to the same restrictions that govern other funds and investment fund managers with regard to how the fund may be structured and how strategies and techniques are employed. Regulations passed in the United States and Europe after the 2008 credit crisis are intended to increase government oversight of hedge funds and eliminate certain regulatory gaps. The fund manager, also known as the fund sponsor or fund management company, trades (buys and sells) the fund's investments in accordance with the fund's investment objective. A fund manager must be a registered investment advisor. Funds that are managed by the same fund manager and that have the same brand name are known as a "fund family" or "fund complex".